Boston has graded over 1,000 restaurants. Here are results. 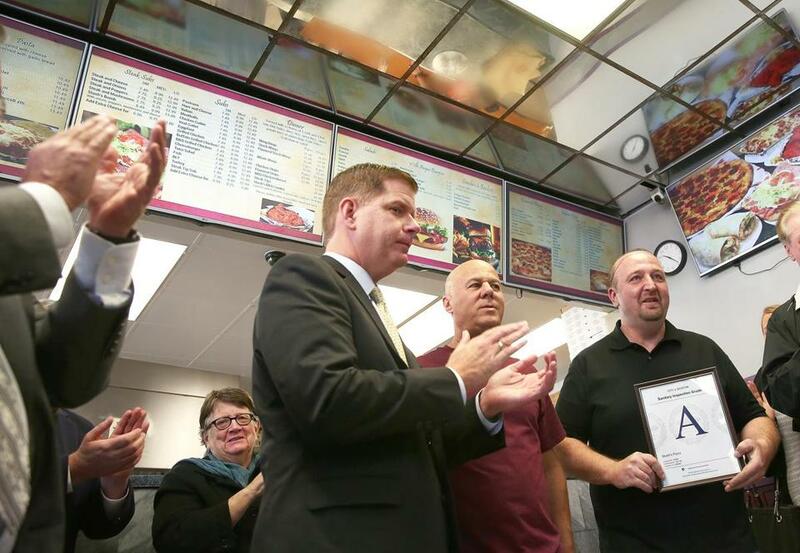 Boston Mayor Martin J. Walsh hands out a certificate to Steve Papantoniadis, owner of Stash&apos;s Pizza. Several months after Boston began issuing letter grades to restaurants to rate their food-safety practices, the vast majority of them have earned an A so far, according to data provided by city officials. The grades, based on the results of municipal inspections, are not yet required to be posted in storefronts. But the city started posting them online last month. More than 1,100 restaurants, or about one-third of the 3,000 restaurants citywide, have been inspected and graded since the program launched this past fall . About 93.8 percent earned the top grade upon an initial, unannounced inspection. Only 38 restaurants, or about 3.4 percent of the total number graded so far, earned a B. Another 31 restaurants, or about 2.8 percent of the total, earned a C, the lowest grade. Virtually every restaurant that didn’t get an A on its first try was able to boost its grade to an A after either one or two followup inspections, the data show. This chart shows Boston restaurants that earned no worse than an ‘A’ letter grade on recent food safety inspections conducted by city officials. In adopting the grading system, Boston joined New York and other cities in attempting to give diners a quick assessment on restaurants’ safety records. The results of the official grading that began this past fall are markedly better than how restaurants would have fared had grading been in place in 2015. A Globe analysis last year found that 37 percent of Boston restaurants racked up enough violations during at least one inspection in 2015 to earn the equivalent of a C.
William Christopher, head of the city agency that oversees restaurant inspections, said he was not surprised to see many restaurants getting As on their first try under the new grading system. Christopher said that restaurant owners and managers have been cooperative with and willing to learn about the new grading system. He also said inspectors, when they have found violations, have done a “tremendous job” explaining the problem and how restaurant staff can correct them. Grading is being done on a rolling basis as restaurants are inspected. For the first year of the new grading program, the grades are only being posted to the city’s website and restaurants can choose whether to also post their grades in their storefront. After that, restaurants will face fines of $300 per day for not posting them in their storefront. ■ To see the list of restaurants that have earned a C on at least one inspection, click here. ■ To see the list of restaurants that have earned no worse than a B, click here. ■ To see the list of restaurants that have earned no worse than an A, click here. 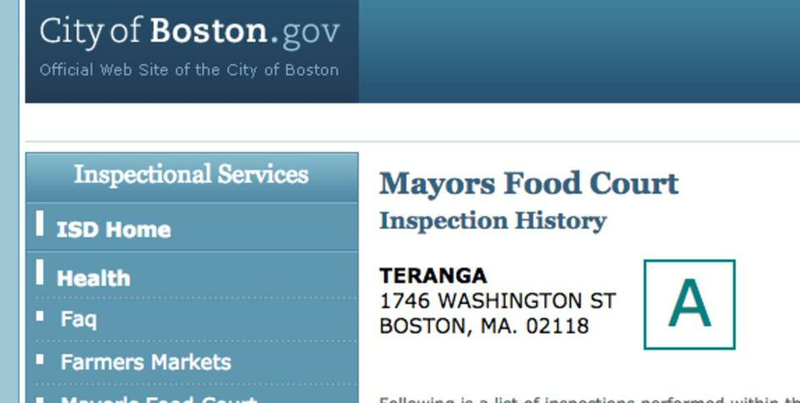 One of the most recent restaurants to be graded was Teranga in the South End. During an inspection, all restaurants begin with a score of 100, and lose a varying amount of points depending on the seriousness of each violation found. Restaurants with scores of 94 or higher receive an A, those with scores between 81 and 93 will have a B, and those with scores 80 or below will get a C.
Restaurants that fail to earn an A on initial inspection get one reinspection, within about 30 days, to try to boost their grades before they are displayed publicly. If a restaurant fails to earn an A after both the initial inspection and the second inspection, its B or C will be displayed publicly. City inspectors will keep working with it to bring it into compliance and educate workers on best food safety practices. To boost its grade at this point, the restaurant would have to pay the city $300 for a third inspection. The restaurant can also pay $300 for a fourth inspection, but its grade after that will be permanent until the next inspection cycle.